Atlantic South Region: The young, and the young at heart, enjoy Labor Day Weekend Pickleball in North Georgia! 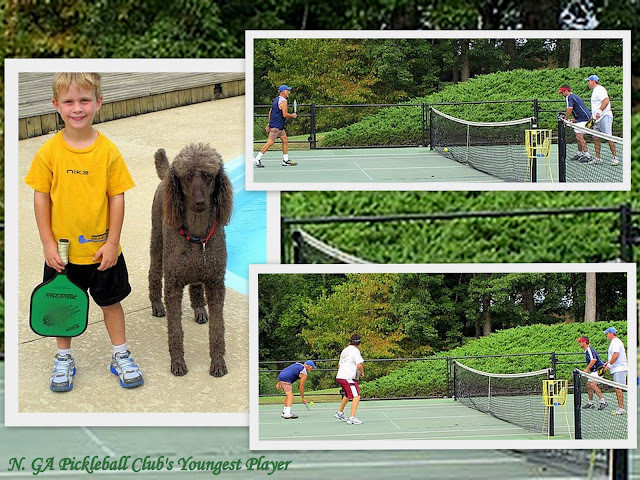 The young, and the young at heart, enjoy Labor Day Weekend Pickleball in North Georgia! Tanner Morneau (pictured with ASR Mascot Bocce) just turned 5 years old last month, but Dad, Mark Morneau is already introducing him to pickleball. And Tanner has a great teacher. Ann Earley of the North Georgia Pickleball Club says that Mark is "unbelievable! Never tested in a USAPA tournament but possibly a 5.0 ranked player. Tanner, she says is definately a 2.5!" Also pictured above are North Georgia Pickleball players, Tom Earley, Dan Ross, Jon Pyle and Marck Morneau. Tom and Anne Early want to send along a reminder to any of the out-of-town players who are planning on playing in their Halloween Pickleball Tournament to contact them quickly to lock in your place in the tournament. Call or e-mail then quickly as they may need to cut off registration soon. Even players from Palm Creek Arizona have already registered to play. This tournament is a benefit for the Cherokee County Humane Society.....and you get a really really cool T-Shirt!!!! "we have dedicated players with squeegees and towels!"